In the history of film, there have been few debut pictures as breathtakingly original as Spike Jonze’s modern masterpiece, Being John Malkovich. Those familiar with his work in music videos would have known how talented and visually inventive he is. Take a look at Buddy Holly by Weezer, Cannonball by The Breeders, Sabotage by the Beastie Boys and Praise You by Fatboy Slim, and you get a sense of what he is capable of. 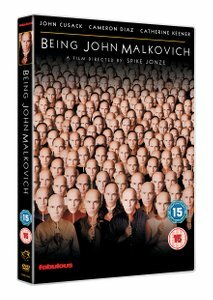 But nothing can prepare you for seeing Being John Malkovich for the first time. If you haven’t already seen it, then stop reading and get watching. Written by Charlie Kaufman, the film imagines a world where behind a hidden doorway on the seventh-and-a-half floor of an office building, there is a portal into the mind of famous movie star, John Malkovich. Once in the portal you get to spend 15 minutes as Malkovich before being unceremoniously dumped onto the side of the New Jersey Turnpike. This film should not work. There’s high concept, and then there’s HIGH CONCEPT, and then there’s high as a kite concept. That this film was ever given the green light is a huge testament to Kaufman and Jonze. As a piece of visual art it is stunning. As an exploration into the themes of identity, consciousness and mortality it is humane, hilarious and deeply affecting. So much of the film’s success rests with the cast of characters. John Cusack is Craig Schwartz, a flat-broke and scruffy puppeteer who lives with his wife Lotte (an almost unrecognizable Cameron Diaz) and a menagerie of animals. Desperate for cash he takes a job on the afore mentioned seventh-and-a-half floor of an office building, where his nimble puppeteer fingers reveal a talent for filing. It is here that he meets and falls in love with co-worker Maxine (Catherine Keener), and then discovers the portal. Which of course leads us to Malkovich himself. His performance is incredible. Gleefully lampooning his persona as a pretentious thesp, it is an absolute joy to watch. When he begins to cotton on to what is happening and takes a journey into the portal himself, it leads to one of the great scenes of contemporary cinema. However, it is Kaufman’s script that is the real star. Constantly funny, surreal, poignant, and bursting with more ideas than most films could ever dream about. It was then, still is now, and will forever remain a work of genius.